In 1996, the Dixie Center for the Arts held their first meeting and began casting a vision for the restoration of this historical and cultural treasure. For a full decade, devoted members ran creative and successful fundraising campaigns and events that brought in the necessary funds to restore the Dixie Theater. 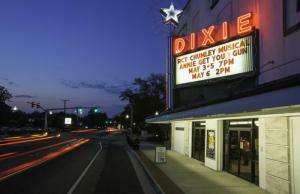 A grand celebration and re-opening was held in 2006, and full seasons of events, parties, and concerts have reinstated the Dixie as a center to be the Home and Heart of the Arts in North Central Louisiana.